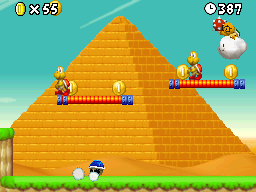 World 2-2 is the second level of World 2 in New Super Mario Bros. This level marks the first appearance of Lakitu in the game. This level starts out with three orange platforms, with a Koopa Troopa found on each platform. Underneath the second platform resides a ? Block that contains a power-up. If Mario hits the bottom of the orange platforms, they bounce slightly. After the first pit, the player encounters a Lakitu. Mario can defeat the Lakitu and take its cloud. Using the cloud, Mario can ride to the top of the level, where there is a line of coins that goes into the sky. The first Star Coin is located there, right before the second set of orange platforms. The player finds several coins and blocks in the area. Past there, two more small pits can be found, followed by a cage of Brick Blocks containing a few coins. Another Lakitu appears by this point. Once again, three orange platforms with Koopa Troopas on top can be found, followed by a Warp Pipe within a pit. To the right of this pipe is the second Star Coin, hidden underneath a small mass of land. Mario should Ground Pound some Brick Blocks to obtain the Star Coin. A red pipe can then be found, along with several Brick Blocks and ? Blocks. Located high above the cluster of blocks reside several coins which are only accessible via the use of a Lakitu's Cloud. Near the cluster of blocks is the checkpoint. Another Lakitu can be found, along with several blocks and two pipes. By entering the green pipe, the player is shot into a Coin Heaven. The final Star Coin is located in the Coin Heaven. Mario has to run across tilting Mushroom Platforms to get to the Goal Pole. Star Coin 1 - Mario must use a Lakitu's Cloud to reach the first Star Coin. It is located above the level right before the second set of orange platforms. Star Coin 2 - The second Star Coin is located below a rock formation. Mario should Ground Pound some nearby Brick Blocks to get to this Star Coin. Star Coin 3 - Mario should go to the aforementioned Coin Heaven, where the last Star Coin is easily obtained via a Pipe Cannon.